Strawberry pretzel salad takes salty and sweet to a whole new level. This make ahead recipe is the perfect dessert for a potluck, holiday dinner or summer treat. 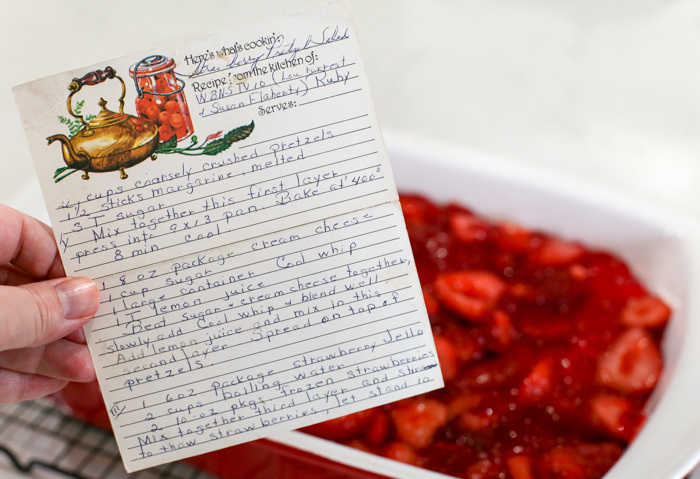 When I stumbled on this recipe in my grandma’s recipe box I was taken back to my childhood where my grandma would make this recipe. I immediately remembered how sweet this dessert was and how electrifyingly salty it was at the same time. Now as an adult, I find this recipe perfectly paired with a cup of coffee after a summer feast. Where Did Strawberry Pretzel Salad Originate? My grandma. Okay, maybe you might be thinking the same thing but it really was birthed from a 1960’s cookbook called the Joy of Jello. My sister-in-law remembers this always being served at their holiday meals so it’s been a staple for quite awhile. It’s been enjoyed at holidays, potlucks and summer barbecues ever since. This specific strawberry jello pretzel salad comes from WBNS TV 10 with Lou Forrest and Susan Flaherty. At least that’s where my grandma says it is from according to her recipe card. Step 1 – Make the pretzel crust. To start you need two cups of coarsely crushed pretzels. 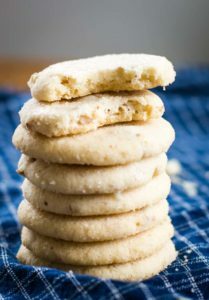 Mix that together with 1 1/2 sticks of melted butter and three tablespoons of sugar and place in a 9×13 pan. You’ll bake at 400° F for 8 minutes. Let cool before moving to the next step. Beat the sugar and softened cream cheese together. Slowly add by hand the cool whip and blend well. Add lemon juice and mix in to the cool whip mixture. Spread on top of the pretzel layer. Mix together the strawberry jello, boiling water and frozen strawberries. Let stand 10 minutes and then pour onto the second layer. Now, can you just add the jello and strawberries right away, sure. But I found that if you let it stand for 10 minutes you get more of a authentic looking strawberry pretzel salad and not one that says, hello! jello! You know that smooth transparent top? 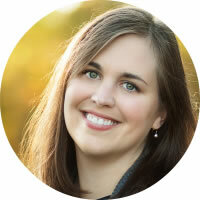 Yeah, this one has more of a rustic look to it which I like. 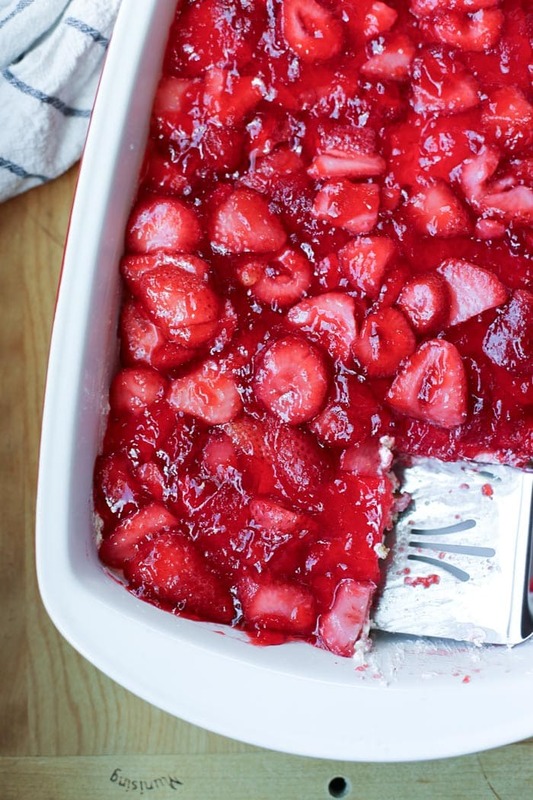 Can You Make Strawberry Pretzel Salad The Night Before? Yes! In fact the original recipe I have says to refrigerate it for 24 hours. I personally only refrigerated it for about 4 hours before serving because I was last minute like that. 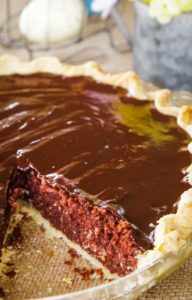 However, this is the perfect make ahead dessert that helps you calm the crazy if you’re making a large holiday feast or taking something to a potluck. Seriously, this dessert takes the salty and sweet to a whole new level. It is a rich dessert that, like I said, I enjoy with a cup of coffee after a delicious meal. It’s also festive looking so it’s the perfect potluck dessert for July 4th or Christmas. 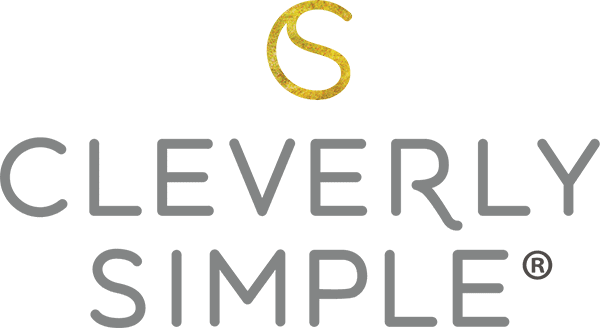 And because you can make it the night before – winner! 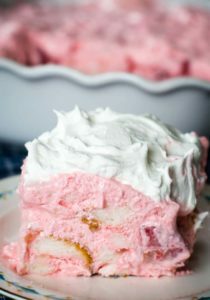 I hope you enjoy this recipe as much as I did and that this strawberry pretzel salad takes you back to the classic desserts your grandma served. Enjoy! 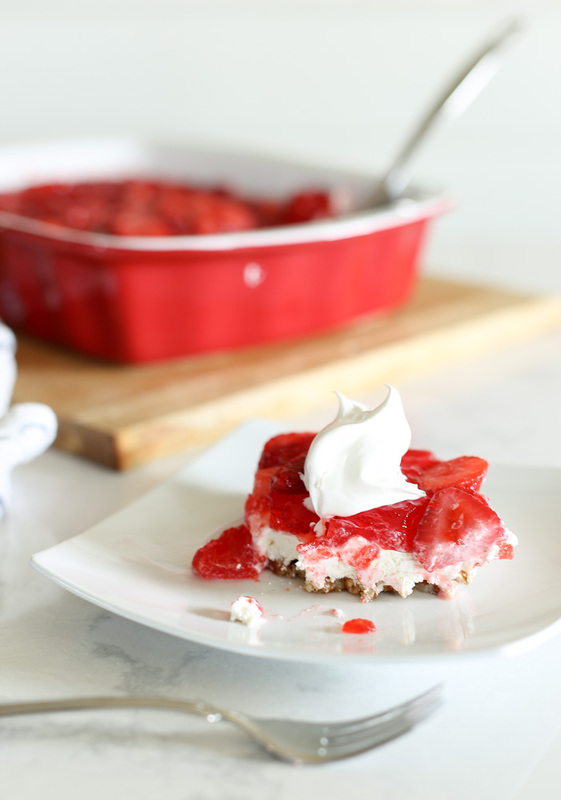 This salty and sweet make ahead strawberry pretzel salad dessert is the perfect recipe to make for the holidays, potlucks and even a barbecue feast. 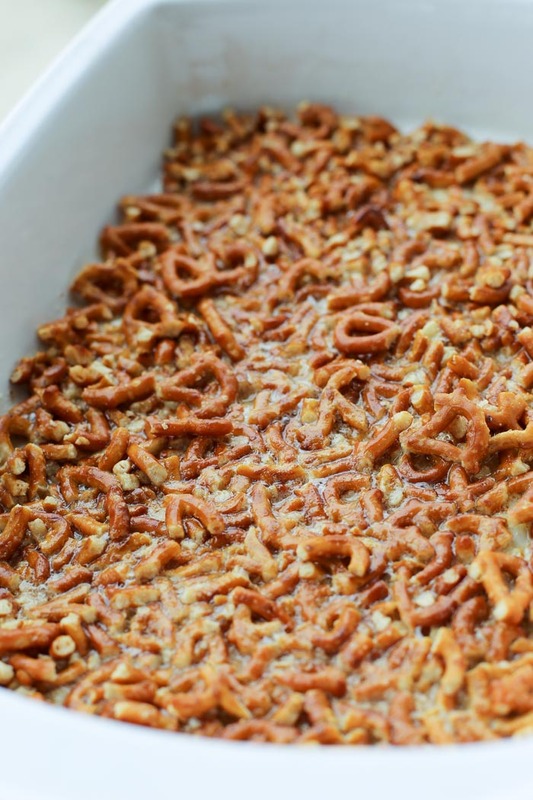 Mix together the pretzels, melted butter and sugar. Bake at 400° F for 8 minutes. Beat sugar and cream cheese together. Slowly add cool whip and blend well. Add lemon juice and mix in to second layer. Spread on topped of pretzels. Mix together jello, boiling water and frozen strawberries. Refrigerate for at least four hours but longer is better! 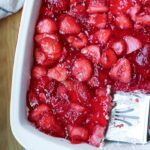 I used the sliced frozen strawberries for this recipe as I found them to be easier to work with. 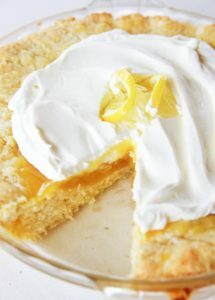 This recipe yields 16 in my opinion because it is such a rich dessert and I only serve smaller slices. This looks so good! I will definitley be trying this recipe. I love making recipes like this that have been handed down from parents & grandparents; they are such special memories:) Thanks!! Yum, I bet the salty crunch of pretzels makes for the perfect crust for this strawberry salad. Perfect dish for summer! This would be perfect for a potluck I have coming up. I am totally going to make this!